98 x 77 mm. – 225 leaves. With 21 full-page miniatures on inserted singletons. The manuscript is lavishly illustrated with twenty-one delightful miniatures attributed to the Masters of the so-called Gold Scrolls group. While each of them is on a verso of a singleton, they act as an artistic unity with the decoration on the facing pages. 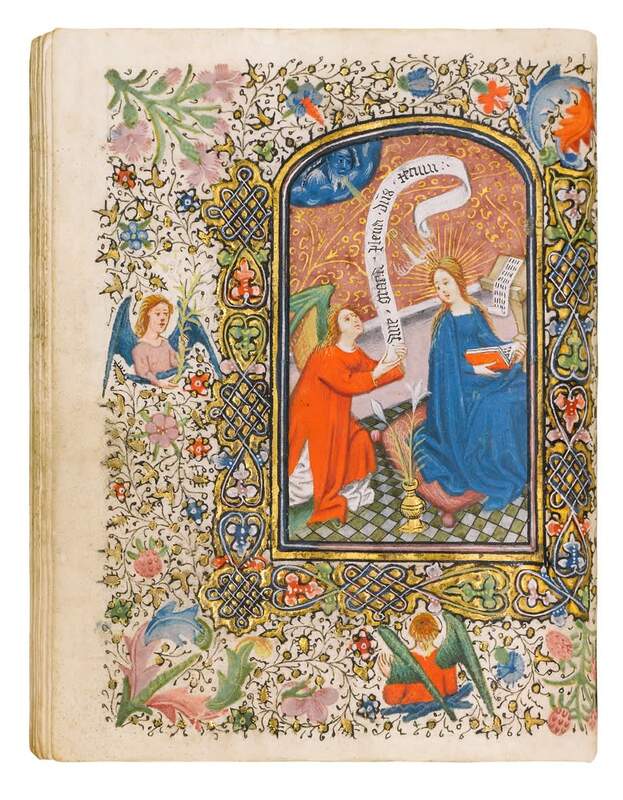 This Book of Hours was presumably made for a member of the Venetian Zane family. Albeit small in size, this elaborate manuscript is full of finely illuminated and elegant texts, manifesting individuality. The calendar, executed with opulent use of gold, is only scarcely filled, which may refer to a commission destined for export. The southern round script may allude to a scribe working for a southern destination. Possibly, the patron was named Benedict and belonged to the Bruges parish of St. James, a parish that was frequented especially by foreign merchants. These specifics imply that this small, portable Book of Hours was a special commission. The Zane coat of arms is added to the decoration and not integrated; it may have been added shortly after the manuscript was completed. This manuscript is of remarkable quality and painted by one of the major hands of the so-called Masters of the Gold Scrolls Group. The oeuvre is named after the delicate feathered scrolling foliage painted with liquid gold on burgundy-red ground, which was frequently used and is easy to recognise. The sweet, soft faces with rounded chins are also characteristic. Special attention is devoted to the depiction of hair, often rendered with bright yellow strands on brown. The figures are drawn with fine precision, their gestures and expressions somewhat subdued, yet expressive and of great intensity. The fine and diligent handling of paint as well as the palette dominated by red, blue, and green with elaborate use of gold in the marginal decorations, together offer us one of the most attractive manuscripts in the so-called Golden-scrolls style.